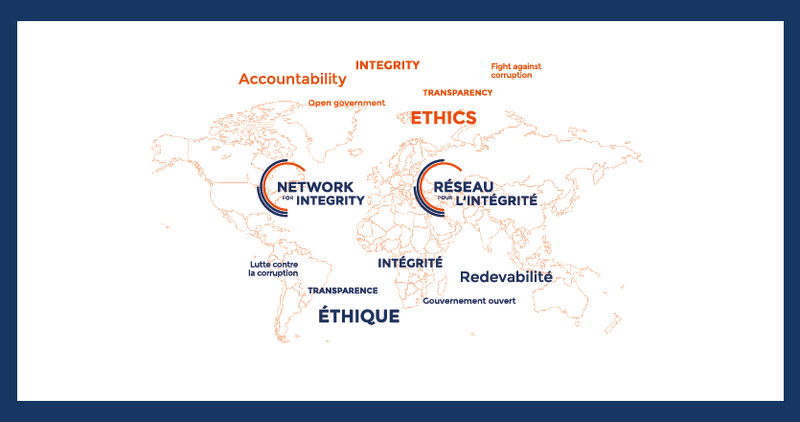 On the occasion of the International Day against Corruption, the 9 December 2016, the Network for Integrity will be officialy presented. The event will take place at the Open Government partnership global Summit to be held in Paris at 7 to 9 december 2016. There will be an opportunity for the founding members to present the project and the objectives as defined during preparatory meetings. The idea of the Network for Integrity comes from a clear conclusion : the integrity of public officials has become a major issue in our society and is a strong expectation on the part of citizens worldwide. Other concepts are also at stake as the fight against corruption, transparency of public action, or open government. All these ideas have a strong international dimension that the Network aims to develop. In this perspective, 14 institutions from 14 countries on 4 continents have decided to join forces. Through their encounters and exchanges they committed to work for the development of an international culture of integrity and contribute to strengthening the confidence of citizens in their public officials. The presentation of the Network for integrity will take place Friday 9th December, from 2 pm to 3 pm, at the Palais d’Iéna (salle Ventejol), with a message of the UN Secretary General, Mr. Ban Ki Moon, and the testimony of Ms. Amira Yahyaoui, founder of the NGO Al Bawsala whose action for the prevention of a blaze in Tunisia was rewarded in 2014 by the prize of The Chirac Foundation.